There are many factors that cause a hair loss. How to grow hair faster and longer? Well, let me only tell you the simple, correct and proven ways. How to grow hair faster and longer? Ginger is not only great for our health but also is very effective for our hair. Ginger has been used for treating a variety of health problems and promoting hair growth for centuries. Ginger is packed with vitamins, potassium, magnesium and phosphorous, all of which provide nourishment to the hair follicles, making them strong and inhibiting hair loss. Take the blended ginger and blend it with enough water until a slightly runny consistency is formed. Or just make it easier by buying the ginger paste. Apply ginger paste to your scalp (with or without olive oil) and let it remains for 45 minutes to 60 minutes. Finally, rinse this paste out with water. This ginger paste can be used twice per week for best results. Can a Hair Growth Shampoo Really Make Your Hair Grow? To use a shampoo to solve hair loss problem may sound too simple, but there are hair growth shampoos that could definitely reduce hair loss. Get a shampoo that contains ingredients that are proven to reduce hair loss and make your hair thicken. One of the must-have ingredients is biotin. Biotin, also called vitamin H, is a water-soluble B-complex vitamin that plays a main role in the health of skin, nails, and hair. Another essential ingredient is keratin. Keratin is a protein that makes up your hair. Keratin now becomes important essential in shampoo. This is cheaper than do keratin treatment in the salon. Some people are convinced that additional nutritional supplements such as amino acids, Biotin and MSM will make their hair grow faster. The internet is full of photos of people who claim that they have a faster hair growth and a thicker bunch of hair by dietary supplements. Below you’ll find the vitamins that would promote your hair growth, make your hair thicker and contribute to less hair breakage. Hair is a protein. If you follow a diet with a deficiency of protein, this can lead to thinning of the hair or a delay in the hair growth cycle. The reverse is also true. If you follow a protein-rich diet, this will result in improved hair growth. Some experts recommend to include calf’s liver, brewer’s yeast, wheat germ and a daily dose of two tablespoons of granulated sugar and lecithin in the diet to maximize hair growth, hair strength, and beauty. Other good food sources of protein are fish, eggs, beans, and yogurt. Soy protein also seems to help in stimulating hair growth. Tofu is a great source of soy protein. Biotin, also called vitamin H, is a water-soluble B-complex vitamin that occurs naturally in various foods such as; milk products, wheat products, nuts, liver, vegetables, and fruit. People with a shortage of biotin often suffer from hair breakage, hair loss, and brittle nails. Research has shown that biotin helps to: increase the elasticity of the hair so that you are less likely to break hair. Biotin also thickens the cuticle so that you get fuller hair. MSM stands for methylsulfonylmethane. It is a sulfur compound that can be found in the body and in foods such as; milk, coffee, tea, vegetables, etc. It is sold as capsules, tablets, powders, and topical preparations. MSM helps with faster hair growth and thicker hair. It helps the body to make collagen and keratin and the hair fiber consists of keratin. Folic acid, also known as vitamin B9, is one of the B-complex vitamins. This vitamin does not promote hair growth but it ensures that your hair and skin remain healthy. A deficiency of this vitamin can cause your hair to become dull. Fortunately, it is fairly easy to get the right amounts of folic acid through food. According to research, vitamin D deficiency can lead to hair loss. Vitamin D is found in healthy hair follicles and is lacking in unhealthy follicles. By massaging your scalp or using a quality brush helps promote blood circulation and the oxygen supply to the hair follicles, allowing the hair to grow healthier and faster. Brush your hair (with brush or fingers) for 100 times twice a day, you will see the amazing difference after a few weeks. By massaging your scalp, you can also solve your migraine and memory problems. There are different types of shampoos and lotions that can make the hair stronger and hold more moisture, allowing the hair to gain more volume. These resources are available in many stores. 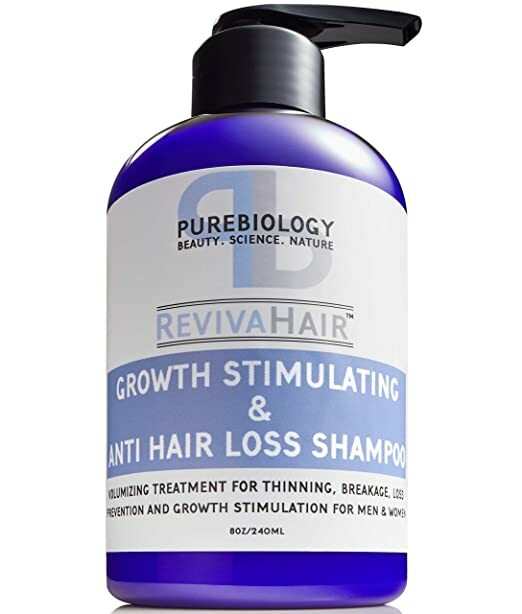 Introducing the 4.9 out of 5 stars of hair growth shampoo (unisex, natural extracts and oils including Biotin and Keratin)– Pure Biology Growth Stimulating and Anti Hair Loss Shampoo. Many are using it and give high comments on it. (You can also look at the Pure Biology Eyelash Growth Serum & Eyebrow Enhancer, which get 5 stars from buyers). All of the ingredients are claimed to be safe and have been used in hair care products for many years, with the exception of the proprietary complex, which contains almost entirely natural ingredients and contains nothing that the FDA deems as harmful. Good Reviews: Here are some good reviews on Pure Biology Growth Stimulating and Anti Hair Loss Shampoo that gave by the buyers. 5.0 out of 5 stars: Great results and it smells wonderful! For years my hair has been thinning and breaking like crazy and I have tried several products. Finally, I purchased this one and it is already changed the feel and thickness of my hair. I almost could not believe the results myself, but the pictures don’t lie. I will be continuing to use this product. Highly recommended by me. And the smell is so refreshing not strong or like a chemical. I stopped using Minoxidil because it’s impossible to leave in all day and the results were unapparent. I bought this product on a whim and without a lot of expectations. After using it for a while, I’ve really been impressed. I can definitely recommend trying this product and would urge anyone who is thinking about to just pull the trigger. I didn’t expect to love this shampoo as much as I do. I have PCOS and am on a form of chemotherapy for my MS, so my hair loss has worsened. I noticed a lot of thinning on my forehead. I decided to try this shampoo after loving a few other PB items. I’ve been using it 2 days on and 2 days off for a little over a week now and I’m already noticing an improvement. Before I was losing clumps daily and now it’s just a few strands every once in a while. Will definitely buy more when this runs out. This shampoo is awesome for thinning or fragile hair. I dye my hair often and started to add strength with vitamins and this shampoo line. The smell is mild but it doesn’t lather up as much as I expected. It seems that I have to clean my shower drain less frequently with my hair so seems like it’s working pretty well. So far I absolutely love this shampoo… the bottle is not big but all you need is just a little… the shampoo itself smells great. I have been using it for 2 weeks and I already see the difference in growth in my hairline.. after washing my hair this shampoo leaves it very soft and moisturized. I can’t wait to see the results I get with more time because it is definitely working. The results pretty much speak for themselves but I’ll elaborate just a tad. I started this product without much hope that I would see any visible results but I figured it couldn’t hurt to try for the price. Pura’dor and all the other hair growth shampoos never did a thing for me but the good reviews and reasonable price led me to take a shot and I’m glad I did because as you can see from photo (took the before picture a few months ago for hair implants I was considering but decided against because of the price. This brand may have just saved me several thousand dollars so I figured this review was the least I could do. Works better than rogaine and that is an all day leave in-treatment and a pain in the backside, to say the least. Plus any mild improvement I saw from it disappeared as soon as I missed a few weeks of the application after going on vacation. Of course, 0.1 out of 5 of buyers were given bad reviews. Here are some bad reviews on Pure Biology Growth Stimulating and Anti Hair Loss Shampoo that gave by the buyers. 1.0 out of 5 stars: MADE MY HAIR FALL OUT!!! PLEASE DO NOT USE!!! The reviews on here are fake!!! This product makes your hair fall out, look matted and dry! It has made my hair worse than what it was, I am warning others to please not buy this and save your hair!! I can’t believe Amazon would allow this to happen but maybe they have no idea whats going on so I will be making a report to them about this company, they are fraudulent and liars! DO NOT USE THIS PRODUCT ladies! We would like all of our customers and potential to know that there is nothing in this product that can possibly lead to hair loss – all of the ingredients are safe and have been used in hair care products for many years, with the exception of our proprietary complex, which contains almost entirely natural ingredients and contains nothing that the FDA deems as harmful. We would also like our customers to note that two reviews were received, both from Amazon accounts with no prior review history, within a several hour time period, claiming the exact same thing when no such complaint had been received prior. If you have a before/after picture, please feel free to post it publicly or message it to us directly on Amazon – we would truly love to see. I’ve been using the shampoo for two weeks with the hope that it will help my hair grow faster. So far all I can say is it smells nice. I’m giving two stars because I’m upset by all the phony reviews. I’ll continue to use the product and IF after a few months it does what it claims, I’ll change my review to reflect that. Then what are the best seller and best review hair growth supplements? Vitamin A, Vitamin C, Vitamin D3, Vitamin B1, Vitamin B2, Niacin, Vitamin B6, Folate, Vitamin B12, Biotin, Pantothenic Acid, Calcium, MSM, Collagen Hydrolysate, Bamboo Extract, Hydrolyzed Keratin. Whats so special about this product? Is it better than just using normal daily vitamins? Yes, better than normal vitamins! I have hypothyroidism which causes my hair to break off or fall out and this has been the only thing that has helped with that. I’ve tried using prenatal vitamins too and nothing had helped me until I started using Hairfluence. I was skeptical at first because I had tried other hair vitamins before with no luck, but I have to say that this really surprised me as it has worked wonders for me! I’m about to order my third bottle! Bald men want this too…it’s amazing!! Amazing product! Balding at 24. As you can see top left is day 1, day 20 is picture 2 and the bottom pictures are the end of one bottle!!! Amazing results for sure!! For any guy who wants to grow their hair out and hesitated like me. 5 stars A must for post partum mommas!!! I started losing my hair in fistfuls at 3 months postpartum and was frustrated and sad! I’ve been using this product for 2 months and can see some improvement in the thickness and definite improvement in the feel and ease of styling. I don’t expect miracles in 2 months and a mane full of luscious hair but hopefully that’s in my future if I continue using it….which I will! PROMOTES HEALTHY HAIR, SKIN & NAILS – Restore the health of your hair, the radiance of your skin and strength of your nails with Natrol Biotin. an important B Vitamin that has long been known as a key element in maintaining healthy hair, skin, and nails. ADVANCED FORMULATION – The beauty supplement includes an important B Vitamin that has long been known as a key element in maintaining healthy hair, skin, and nails. 100% VEGETARIAN – Go ahead, nourish your inner beauty with Natrol Biotin. I suffer from polycystic ovary syndrome and was having serious issues with hair loss on the top of my head. I had been resorting to comb-overs to hide the balding spots on the top of my head. I have now been taking one biotin pill nightly and my hair loss problem has basically been eradicated. I am including a picture of my results. The picture on the left is from July 1, 2016, and the picture on the right is October 13, 2016. Great product. Highly recommend. Thinning Hair = Buy This! Wow! I had low expectations for this product, however, t really has worked. Granted my hair is longer in the photos, but I can tell it’s starting to fill back out. It has also made my hair grow super fast. I haven’t experienced any allergic reactions to it or weight gain from it. I’m telling all of my buddies with thinning hair about it! The picture speaks for itself. I lost a lot of my hairline due to postpartum shedding and decided to try the Biotin due to good reviews. It hasn’t disappoint. This is 3 weeks of progress and still growing. I hope you enjoy and get the knowledge from the post. And if you have any questions or any comments, please feel free to leave a message below. This is all great info thanks. My brother has suffered a reseeding hairline and has developed a bit of a complex about it. I sent him the link to this post. I hope the info will help your brother.